A native New Yorker and former professional actress, Amy has lived, gardened, cooked, and been active in food politics in California, New Orleans, Houston, and upstate New York. She is a certified food processor, a Master Gardener, and helped start a farmers' market and RSAs (restaurant supported agriculture) in Houston. She has served on several non-profit Boards of Directors, most recently for the Queen's Galley in Kingston and NYSSFPA(NY Small Scale Food Processors Assoc. 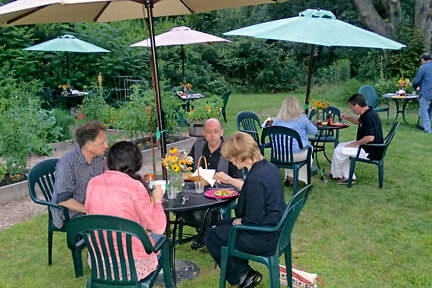 ), and is a long-time member of NOFA, Chefs' Collaborative, and Just Food. Amy's food is simple, local, and seasonal with an international flair. (Some call this description "New American Cuisine".) She has been passionately committed, for over 20 years, to supporting local growers and food processors and to buying seasonal and regionally-produced ingredients whenever possible. However, she's not a 'purist' so you'll also see ingredients that are obviously not local on her menu. Amy cooks 'from scratch' and also extends the short Catskills growing season with a variety of preservation techniques. Recycling "rules" at Amy's Take-Away: all green waste is composted and nontoxic cleaning products, energy efficient equipment, and recycled carryout material are used. Rest assured that food at Amy's Take-Away is non-GMO, locally sourced as much as possible, and farm fresh! Amy's Take-Away is an extension of the house (built ca. 1885) that operated as the H.D. 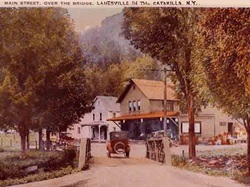 Lane General Store until the 1960's. A small piece of Greene County's history has been resuscitated by creating a new kind of country store where the traditions of the past "meeting house"-courteous service and a friendly atmosphere-combine with high-quality food and attention to detail.